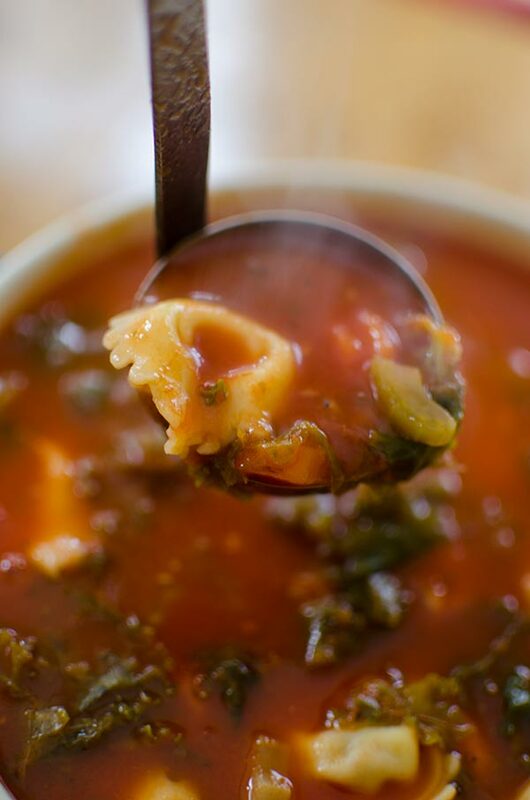 This recipe for tomato tortellini soup with kale is so easy and comforting flavoured with basil, garlic and veggies! Current status: a little run down and consuming way too much news. Both of which are without a doubt, 120% my fault. I could sleep more, but I don’t. I could turn off the TV, shut off my CNN breaking news updates and stop reading 18 New York Times articles a day, but I probably won’t. That said, I have been trying. Trying to get more sleep, trying to consume less news (while still being very informed and involved), trying to take those healthier steps to hopefully not be run down all the time. I’m a pretty social creature who thrives on work, keeping busy, and surrounding myself with inspiring people who push me to be better (and who I love, obviously). But I also love to do things on my own, sit in a quiet room with a good book, see a movie by myself, you know I actually like spending time on my own. With all of these things, I’ve realized that I can function pretty well on minimal sleep, but every now and then (especially during the cold months), I just get in the mood to hibernate. To curl up inside with a Netflix or HBO marathon (currently rewatching GIRLS), a warm cup of coffee or tea or hot chocolate, maybe some time spent in the kitchen making a cozy and comforting vegetarian risotto. Hibernate for a day, a weekend or a week, sometimes taking a little space and time to relax is just what the doctor ordered. 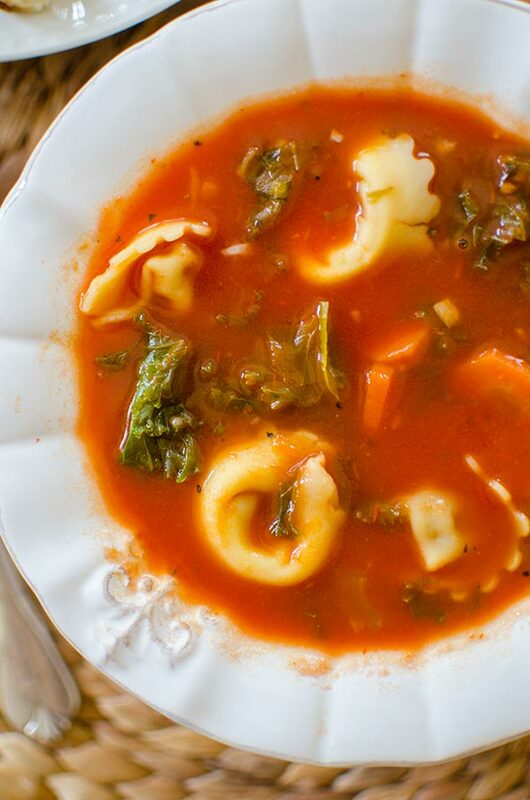 Case in point, this tomato tortellini soup with kale was a recipe that came out of one of those hibernation sessions. If you follow me on Instagram (and if you don’t, you should go follow me now), you know that last weekend I spent some time hibernating and developing new recipes. I think I do some of my best work when I give myself space and time to create in the kitchen. I head to the grocery store with a bit of a plan (it usually involves some kind of carb and some kind of cheese), and then allow myself to be inspired by whatever ingredients I stumble upon. For this tortellini soup, I found a beautiful bunch of kale, and some tortellini which was on a serious sale. I jumped in the car to head home, with the latest Mumford and Sons album playing, and started to formulate the recipe in my head. I knew it would be some kind of soup, a mirepoix (onion, carrots and celery) would be required, but that was all I had in mind. 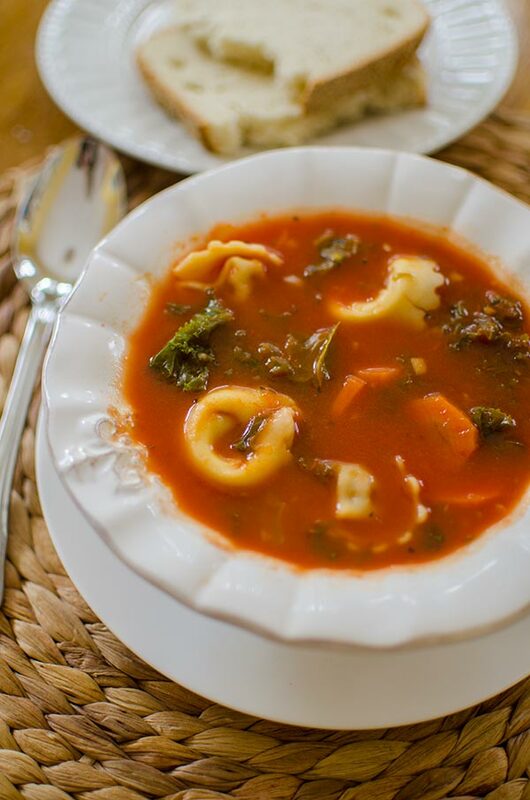 When I got home, I was talking with my mom about this soup and she told me that when I was growing up, she used to make my sister and I a delicious tomato, tortellini and spinach soup and she still had the recipe! I don’t really remember eating this soup (my mom hasn’t eaten gluten for 20+ years so this soup fell out of the rotation), so I took a look at her recipe and was totally inspired. I made some changes and tweaks, to make this recipe a little more to my style of cooking, but after the first test, I knew this recipe was a complete winner. Ready in less than 45-minutes, this is the perfect weeknight meal, and I’ll be honest and tell you that I brought this soup to work for lunch for five days in a row–without getting sick of it! You can use whatever tortellini you have on hand–I’ve tried this recipe with both cheese tortellinis and sausage tortellinis and they are equally delicious! Go for the cheese stuffed pasta if you want a vegetarian version, but the sausage tortellini was definitely my favourite. For this recipe, the carrots and celery are sliced (keeping prep super minimal), and the kale is stirred in at the end, the same way you’d add spinach to a soup. I love adding kale to soups, and if you do too, you should try my Moroccan vegetable soup. In a large soup pot, heat olive oil over medium. Add onion, carrots and celery. Cook for 5-7 minutes, until slightly softened, stirring frequently. Add garlic and salt, cook another minute. Add crushed tomatoes, water and basil, and bring to a boil. Add tortellini and cook according to package directions--about 5-8 minutes. Stir in kale, and cook another 2 minutes. 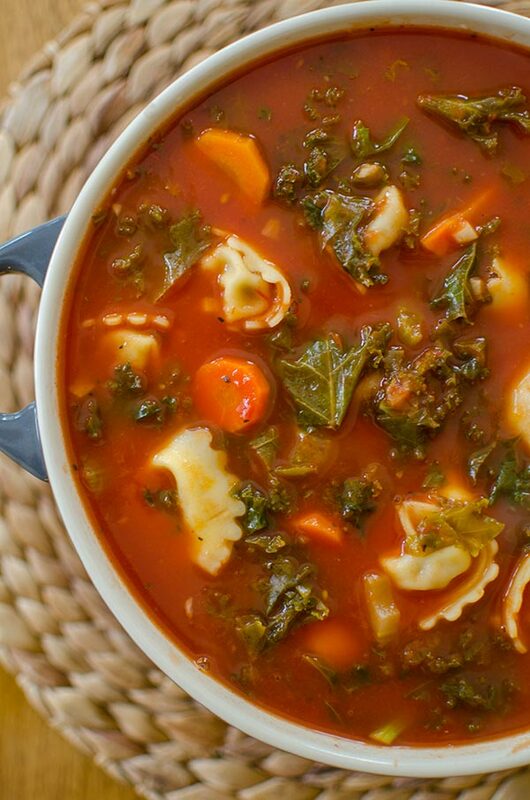 Let me know if you give this tomato tortellini soup with kale a try in the comments below. Oh my goodness; yet another delicious looking soup that I am going to make after I pick up the tortellini & the kale! Could you do this in a crockpot? Or would it way overcook the tortellini? Thinking about a meal that can do well in a slow-cooker for after class meals! Hi Alexan, you could try this in a crockpot but I would recommend adding the pasta and kale about 20ish minutes before you're going to eat it. I haven't tried it myself, so let me know how it goes!